Julian AssangeTM refused to meet actor Benedict Cumberbatch when the Sherlock actor was preparing to play the WikiLeaker in upcoming movie The Fifth Estate because he didn't want to be associated with a "debauched" performance in a "wretched" film. In an email to Cumberbatch released on WikiLeaks [does that count as a leak? – Sub-Ed], the six-fingered Australian asked the actor to reconsider his involvement in the project. 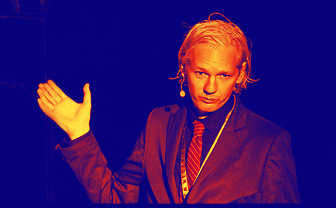 Assange has claimed the movie "vilifies and marginalises a living political refugee to the benefit of an entrenched, corrupt and dangerous state". The white-haired one, who is still lurking in the Ecuadorian embassy, accused film studio DreamWorks of having ties to "powerful interests in the US government", adding that it had ignored books that praised WikiLeaks and chosen to base its script on the two most "toxic" and "biased" accounts instead. "DreamWorks has based its entire production on the two most discredited books on the market," Assange wrote. "I know the film intends to depict me and my work in a negative light. I believe it will distort events and subtract from public understanding. It will resurrect and amplify defamatory stories which were long ago shown to be false." In a press release, WikiLeaks said that Cumberbatch's reply to Assange was "courteous and considered". The organisation also pointed out that the actor – the man Reg readers most hoped would be the next Doctor Who – had said in interviews with Vogue and The Guardian ahead of the film's release that he was concerned about the movie's portrayal of Assange. In The Guardian interview, which WikiLeaks linked to, Cumberbatch does say that he "worried that it cast Assange as some kind of cartoon baddie". But he said that was when he first read the script and that it "evolved into a more nuanced portrayal".